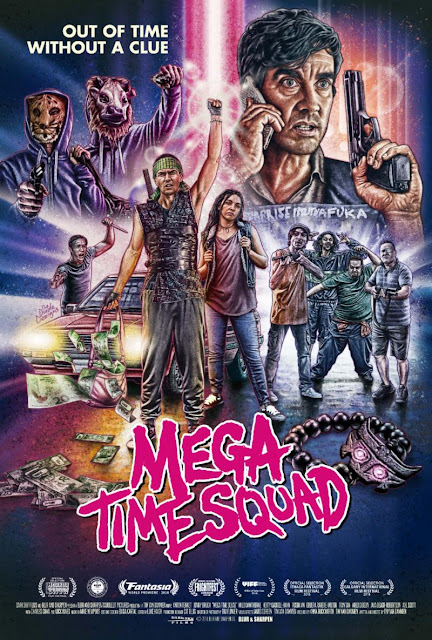 Dark Sky Films proudly announces the release date and trailer of the highly anticipated festival fan favourite MEGA TIME SQUAD coming to theaters and VOD Blu-ray and DVD. MEGA TIME SQUAD is a wildly entertaining time travel/sci-fi comedy out of New Zealand. A fan favorite on the festival circuit, the film stars Jonny Brugh (What We Do In The Shadows) and was praised by Variety as "fast-paced, determinedly silly, with sharp slangy dialogue,"the film blasted out of the gate at this year's Fantasia and is destined to become a cult favorite. all in small town Auckland." A low-level criminal steals an ancient Chinese time-travel device, but he may not survive the demonic consequences of tampering with time. MEGA TIME SQUAD comes to theaters and VOD 15th February 2019 comes to Blu-ray and DVD 9th April courtesy of Dark Sky Films. Arrow Video will release MEGA TIME SQUAD on Blu-ray in the UK on 20th May 2019.